Massachusetts Farm Bureau Federation and Nourse Farms in Whately are planning ‘Camping for a Cure‘ on June 10. This is a fundraiser for the Massachusetts Farm Bureau Federation’s Pan-Mass Challenge team. Currently, five farmers are set to ride more than 750 miles combined on Aug. 5 & 6 to provide cancer patients, who can’t ride in this bike-a-thon, with hope and support. Unlike most charities, the PMC donates 100 percent of the funds raised. Last year the organization raised more than $47 million for Dana-Farber Cancer Research Institute, which is more than 80 percent of the institute’s annual funds. For this reason, the PMC is much more than a ride, it’s a source of hope for those whom may have little to none. You can learn more about the pmc online at www.pmc.org or you visits our team profile at http://profile.pmc.org/TM0329. To help us do this we would love to have some local farms, agricultural organizations, or some students to help us out by providing an educational or fun activity or craft or helping out for an hour or so to help campers set up tents at the Camping for a Cure event here. Among the farms who have already made a commitment are Nourse Farms in Whately, Davidian Bros Farm in Northborough, Pine Island Farm in Sheffield, Sauchuk Farm in Plympton and Willow Brook Farm in Holliston. During these events, young families will have the opportunity to experience farm life. During the day, each campsite will host a children’s fair, during which a petting farm, horse pulled wagon rides, face painting, read-a-longs, coloring events and more may be held. After a day full of these terrific activities, a camp-out will be held in the evening where a movie will be shown. We hope you can join us in some of the exciting campus and community events happening as we wrap up our spring semester! Come learn about majoring (or double majoring) in SFF! Join Jackie Montminy, SFF student, in 20 minutes of kickboxing and discussion about impactful ways to make positive change! Join Stockbridge Seniors share their Sustainable Food & Farming focused research at the UMass Undergraduate Research Fair. Free coffee! For more information on the Bachelor of Sciences degree in Sustainable Food and Farming, see: SFF Major. The following is a note from SFF student Sierra Torres…. I am reaching out to you all today with a really awesome opportunity to help plan some events for SFF community and beyond this semester. Currently I am organizing a three part film series surrounding issues within the food system or related to climate justice in general. Because this event is being designed for your enjoyment, I wanted to get feedback on which films you would like to see this semester. The following link is a brief poll where you can vote on which film you would like to see. There will also be links to the trailers if you have not heard of the films. The top two films will be shown in March (dates to be determined). This poll will close on February 20th. Based on what movies you all choose, we hope to also host a panel of local speakers in the field of study related to the films after the showings. If you have someone in mind who might be a perfect speaker for one of the films, feel free to leave a comment on the last question on the survey or feel free to email me personally. There will also be a contest for you all to submit designs for the poster. So if you love drawing or working with digital art, we will be running a contest for you all to submit designs of your original art work for the posters. The person with the best poster will win a Stockbridge Sweatshirt. Attached below is a PDF with the contest details. Feel free to email me with questions. If you graduated from the Stockbridge School of Agriculture, the Plant and Soil Sciences Department, or BDIC with a degree in Sustainable Food and Farming, Sustainable Agriculture, or a related area in BDIC….. well…. You are invited to join us to reconnect with your alma mater, your old teachers, and your friends! Join us Saturday, October 1 starting at 9:30 am for a fun-filled day at UMass Homecoming! Start the day with coffee and light refreshments, and then join us for tours, program information, games, and lunch! I’ve always had a thing for creepy crawlies. I was the kid who always caught the wasp stuck in the classroom to let it out the window. I’ll still crouch to move a worm from the sidewalk into the grass. So when a colleague of mine, Sara Eddy, started her first beehive, I devoured her Facebook posts about the process. And this spring, I had a chance to visit her and her bees. The hive sat pertly in her Amherst backyard, painted lavender and protected from bears by an electric fence. The smoker she uses to calm the bees waited in her driveway, puffing a stream of gray into the air from its metal spout. Asked about bee stings, Eddy shrugged it off. “Last year I was stung three times,” she said. “But one of them was in front of Seelye,” the building at Smith College where Eddy works. There’s just something compelling about bees. At age 29, Sylvia Plath – among our region’s most well-known poets – embarked on the adventure of beekeeping. The fuzzy yellow-brown insects soon swarmed into her writing, inspiring her famous sequence of bee poems. Plath’s queen bees are metaphors for feminine power, leaders of an army of infertile female workers who protect the hive, collect food, and raise young. Besides Plath, our region has other special connections to honeybees. The walls of Seelye Hall have been home to a huge community of 40,000 bees for more than a decade. A 2012 effort to move the bees failed because the hive’s exact location couldn’t be found. The creator of the modern beehive, Lorenzo Langstroth, also lived and worked here, serving as pastor for Greenfield’s Second Congregational Church in the 1840s and ’50s. Sometimes called “The Father of American Beekeeping,” he was celebrated June 4 at the church’s yearly Bee Fest. 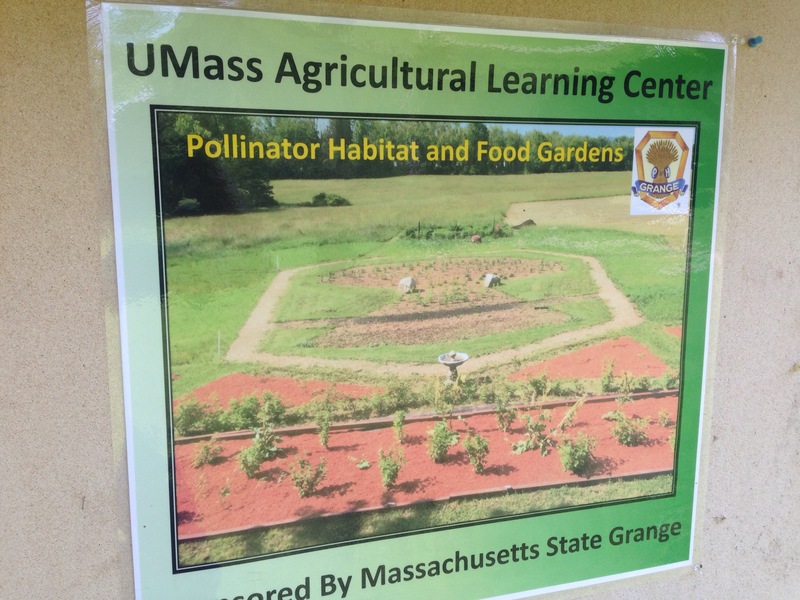 And the first university apiary program in the nation was founded at the University of Massachusetts. Students from the UMass Beekeeping Club are installing the new hives at the UMass Apiary. In Eddy’s backyard, I watched her honey-drudgers scurry near their long, slender queen on a hive frame pockmarked with brood cells and pollen. Eddy said she began keeping bees in part to do her share to fight back against the phenomenon of colony collapse disorder. Since 2006, an average of 30 percent of all hives yearly have failed to survive, according to USDA statistics. This past year saw a 44 percent hive loss nationwide. But she soon found she was in for as much of a challenge as beekeepers everywhere. Her first hive contracted the bane of beekeepers: varroa mites. These tiny tick-like pests are an invasive species first documented in the United States in 1987. Despite Eddy’s efforts to overcome the infestation, the hive succumbed. By spring, the bees were dead. Hives infested by varroa often survive the summer but fail in winter, when bees can’t leave the hive and must survive off their summer reserves of honey and strength. A battle has also been raging over whether a new class of pesticides used since the 1990s, neonicotinoids (known as neonics), are partly responsible for colony collapse. Neonics aren’t sprayed on fields but instead applied to seeds before planting, theoretically making them safer. Growing plants take up pesticide into their leaves and flowers as a “systemic” pesticides that only kills insects that eat the plant. Used on crops that bees don’t pollinate like corn and soybeans, neonics shouldn’t reach bees. But in practice, bees may get exposed by several routes. If not carefully handled, dust from treated seeds can waft away before and during planting. Studies have found neonics in soil, water, and bee favorites such as dandelions near treated crops. Known toxins to bees, neonics can also interfere with their navigation, according to controlled studies where bees were fed the pesticide directly. But so far, just one 2015 study has linked the amount of neonics actually present in the environment to increased levels of colony collapse. And where neonics are common, other bee toxins are often present in even higher amounts – especially pesticides sprayed by homeowners to kill mosquitos and other pests, according to a separate 2015 study in the journal Nature. “There is not enough evidence to call for a complete ban on the neonics – there are simply too many beekeepers successfully keeping healthy hives in areas of seed-treated crops,” notes professional apiarist Randy Oliver, who writes the blog ScientificBeekeeping.com. Experts now believe that no single problem prompts colony collapse. Varroa, pesticides, global warming, and habitat loss can all stress bees. Weakened by one problem, the hive simply can’t survive the others. Conlon, who provides pollinator hives to farms, noted that farmers are often eager to work with apiarists to help minimize bees’ pesticide exposure, such as by spraying at night when bees aren’t active, or choosing non-persistent chemicals. Conlon is also one of just 15 beekeepers nationwide USDA-certified to raise and sell Russian queens, a strain of bee resistant to varroa mites. Most honeybees today come from an Italian strain imported to the U.S. in the mid 1800s. The Russian bees remove mites from the hive, grooming them off each other and the larvae. Conlon said his 1,200 hives, all housing Russian bees, no longer require chemicals for mite control. For the backyard beekeeper, this option may help provide a respite from the struggle to keep bees alive. “The future of beekeeping is like a three-legged stool,” said Alice Armen, a Montague resident who has kept bees for 16 years and recently bought three of Conlon’s queens. A broader gene pool including bees like the Russians, a decreased reliance on pesticides, and community sharing of knowledge and ideas will help bees recover, she said. In terms of community, beginners hoping to own a hive can join the Franklin County or Massachusetts Beekeepers’ Associations for advice getting started and to meet potential beekeeping mentors. The Massachusetts Beekeepers’ Association will also offer hands-on workshops at its annual field day June 18 at the UMass Agronomy Farm in South Deerfield. Eddy went into the 2015-2016 winter, her second year keeping bees, with two hives of Italian bees. In spring, she discovered one hive was empty, despite having had no mites. At first, she said, she was devastated. But then she opened her surviving hive. The number of bees had doubled. One hive had simply moved in with the other – perhaps because it lost its queen, or had been disturbed by a mouse Eddy found living underneath. Naila Moreira is a writer and poet who often focuses on science, nature and the environment. She teaches science writing at Smith College and is the writer in residence at Forbes Library. She’s on Twitter @nailamoreira. The Stockbridge School of Agriculture teaches a course, STOCKSCH 166 – Practical Beekeeping, as part of the Sustainable Food and Farming degree program. The UMass Foundation is a private, non-profit corporation founded in 1950 to foster and promote the growth, progress and general welfare of the University of Massachusetts, recently ranked as the No. 1 public university in New England in the World University Rankings. The Foundation provides a depository for charitable contributions to UMass, manages the University’s endowment, promotes private support of public higher education, and supports the fundraising efforts of the five UMass campuses—UMass Amherst, UMass Boston, UMass Dartmouth, UMass Lowell and UMass Medical School. Spring has sprung at the UMass Stockbridge School of Agriculture and as you might expect, our students are busy at work in some of our many gardens and farms. For a more complete list of student projects, see: Sustainable Food and Farming Student Projects. Below is an article from the local news a week earlier…. AMHERST — If University of Massachusetts officials fully divest the state system’s endowment from the top 200 publicly traded fossil-fuel companies as student protesters are demanding, a UMass economics professor says the impact would be largely symbolic — at first. The Stockbridge School of Agriculture is proud of our passionate and engaged students in Sustainable Food and Farming. Stockbridge encourages students to “learn by doing” and we would like to share some of the things we are doing with you – especially if you…. Here are some student-organized events which we thought you might enjoy…. 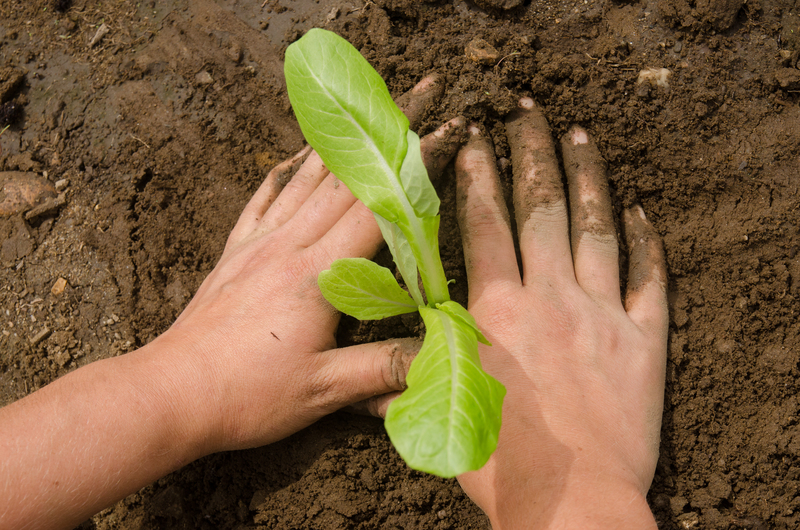 Spring Volunteer hours will be held every Tuesday, Thursday and Friday 9:30 AM – ­11:00 AM at the Franklin Permaculture Garden outside of the Franklin Dining Commons. No prior experience is required, just show up and get your hands dirty! Thursday March 31 the UMass Bee Club will be hosting another candle making event! We encourage you to bring your shot glasses to make personalized tea candles. The event will begin at 7 in Fernald Hall (right next to Franklin Dining Common). Saturday, April 2 the UMass Amherst Beekeeping Club will help us redefine our relationship with bees and create a new paradigm of caring for bees.This event is FREE for UMass Students. $20 for public. Monday, April 4 the Spiritual Ecology and Regenerative Systems Initiative will sponsor a DIY Herbal Spa Workshop in French Hall room 102. Come and make your own herbal body care products. Wednesday, April 6 the UMass Student Farm will have its Spring Farmers Market and Celebration. Music, vendors, food and fun. Stop by the Cape Cod Lounge any time from 12:00 noon – 4:00pm to join the fun and check them out! Wednesday, April 6 a group of students in the Sustainable Food and Farming major will sponsor a New Farmer Panel and Expo at the Earth Foods Cafe, right after the Farmers Market on the same day. The will run from 4:00-6:00pm. Join us! Please stop by the festival and join in the fun! Stop by the Stockbridge School of Agriculture booth for fun and educational stuff on Earth Day at UMass, April 22 from 9:00am-6:00pm at the Student Union North Lawn! To stay connected or hear about more events like this…. please join our Facebook Group… Sustainable Food and Farming. 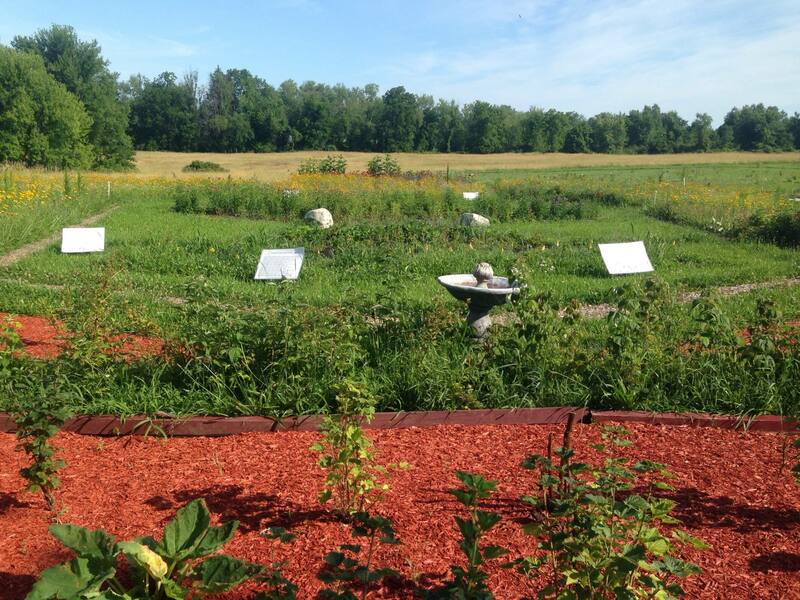 To see more of the “hands-on” projects of students in the Sustainable Food and Farming major check out STUDENT PROJECTS.…. and get involved! 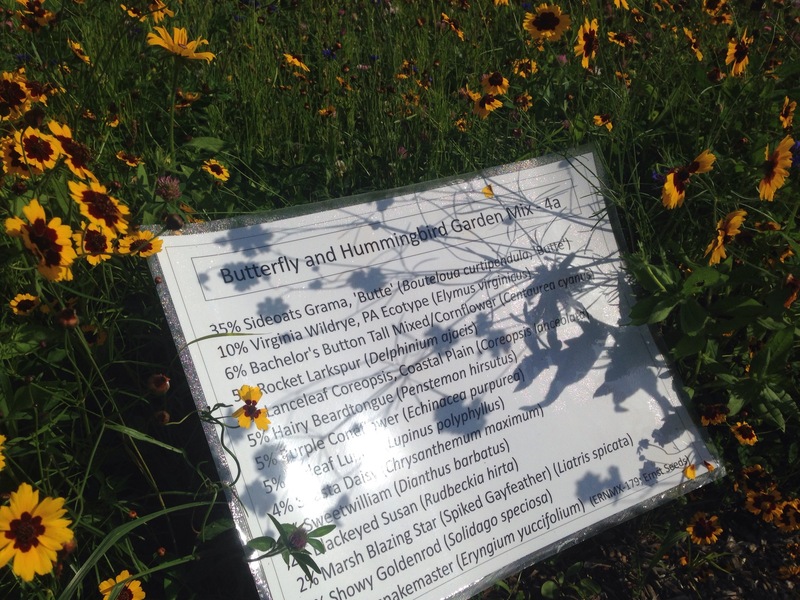 You are invited to stop by the UMass Pollinator Garden at the Agricultural Learning Center to see several beautiful plantings that provide habitat and feed for both native and honey bees. The garden was sponsored by the Massachusetts State Grange and is manged by Professor Stephen Herbert, a faculty member in the Stockbridge School of Agriculture. 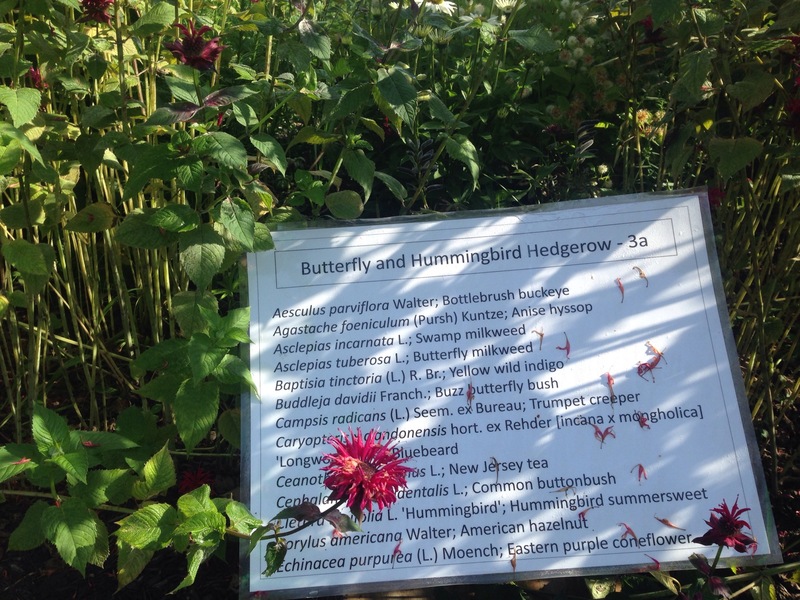 Among the many types of plantings on display, I think the butterfly and hummingbird hedgerow is my favorite. 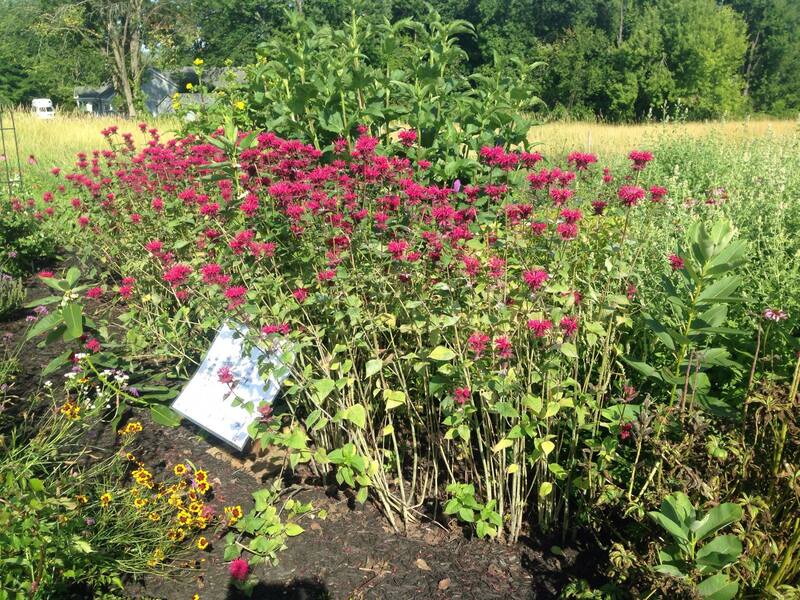 The red flower is Bee Balm, also known as “patriots tea” because it was used as a tea-substitute after the American Colonists dumped British tea in Boston Harbor! 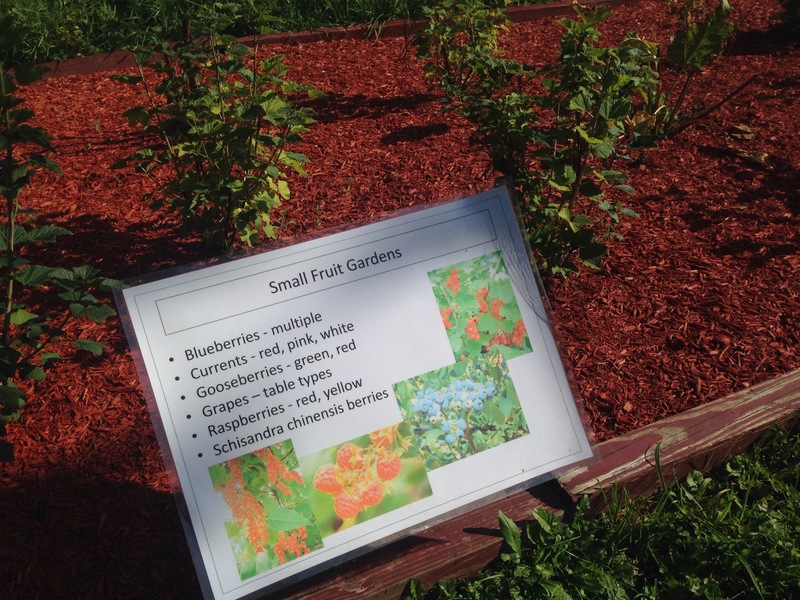 Bees and other pollinators will also be attracted to productive fruit plantings. 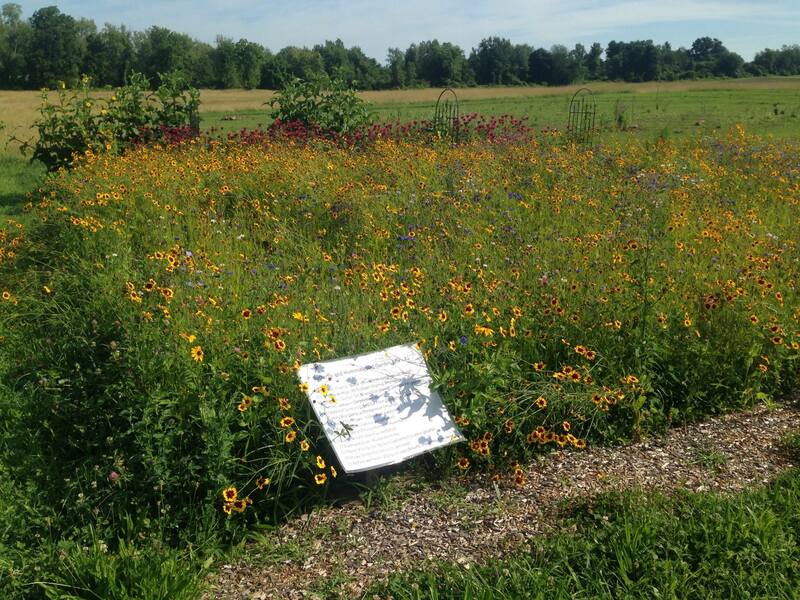 If you have the space, the butterfly and hummingbird seed mix makes a nice looking pasture of wildflowers. Below is short video of Professor Herbert, welcoming you to the garden! The garden is located behind the Wysocki House at 911 North Pleasant St. in North Amherst, MA. You may park in the Wysocki parking lot and walk back toward the field. Be sure and say hello and ask questions from the students and faculty who are often working on the site!